Biogeosciences | Identification of past methane emission altering the foraminiferal tests by secondary overgrowth of calcium carbonate. 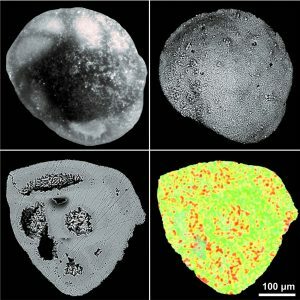 EGU Blogs » Divisions » Biogeosciences » Identification of past methane emission altering the foraminiferal tests by secondary overgrowth of calcium carbonate. Measurements on the benthic foraminifera called Cassidulina neoteretis were used to assess past methane emissions from the seafloor. credit: Hesemann, M., 2017, Foraminifera.eu Project). Ever heard about foraminifera? These tiny benthic (living at the seafloor) marine organisms are common in oceans across the globe and can be used to accurately give relative dates to sedimentary rocks. But we can also use them to identify past methane emissions from the seabed by studing their test or shell! The measurements were done on foraminifera called Cassidulina neoteretis , which is a typical species in Arctic environments and have a hyaline calcareous finely perforated wall that might be altered diagentically. Such diagenesis may occur when the tests experience seafloor methane seepage, of which the sampling was described in a previous blog post. Methane-derived authigenic carbonate (MDAC) crystals precipitate on the exterior and interior test walls, encrusting the test and allowing a detailed analysis of past methane emissions. 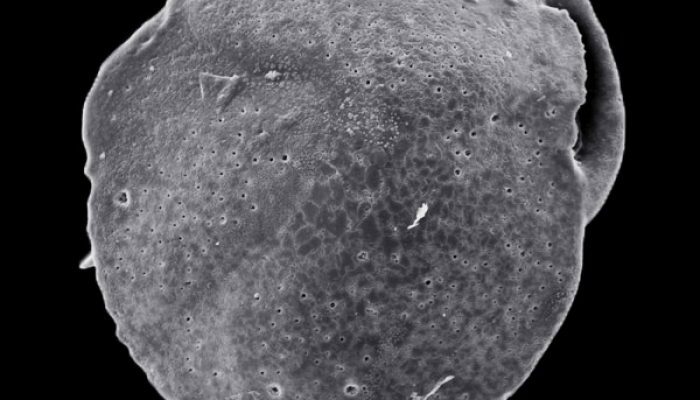 upper left: light microscope view of the foraminifera test. Foraminiferal tests having experienced major diagenetic alteration appear “frosty”, with low reflectance and transparency, and yellow to dark brown colour. Upper right: Backscatter Scanning Electron Microscopy image of the exterior test wall. The “frosty” appearance of the tests is caused by methane derived authigenic carbonate (MDAC) precipitation. Lower left: Backscatter-SEM image of a polished wall cross section. Solid MDAC crusts on the interior wall are up to 10 µm thick and appear slightly darker on electron backscatter images due to lower backscatter response of high-Mg calcite compared to foraminiferal calcite.Lower right: Correspondent Energy Dispersive X-ray Spectrometry image. The colour-change from green dominating on pristine foraminiferal calcite test towards a yellow-orange hue reflects higher Mg-content in the MDAC crust (Credit: Andrea Schneider, Centre for Arctic Gas Hydrate, Environment and Climate) . The pictures show what we call the secondary overgrowth of calcium carbonate on these individuals. The benthic foraminifera are well known to calcify their shell in calcium carbonate, but because of the high methane concentration, there is a precipitation of methane-derived authigenic carbonate, which has precipitated on the foraminiferal shell. This is an evidence for past methane emission, which is important to quantify. Dr. Pierre-Antoine Dessandier, post-doc researcher at CAGE, center for arctic gaz hydrate, climate and environment, university of Tromso, Norway wrote this blog post. After obtaining his PhD at Bordeaux university (France) in 2015 on micropaleontology, Pierre-Antoine moved to Tromso in Norway to continue his work on benthic foraminiferal ecology and paleo-environments. His main research interests are the use of benthic foraminifera as bio-indicators of climate change and methane emissions in the Arctic seas, using ecology of species and isotopic measurements. He is currently working on active methane seepages in the Barents Sea to reconstruct the chronolgy of the past methane emission and their link with climate change.